Pikangikum is located approximately 100 km northwest of Red Lake, Ontario and is one of the largest First Nation communities in Northern Ontario, with the highest on-reserve population of approximately 2,300. An estimated 75% of the population is under twenty-five years of age. The large population has had a significant impact on infrastructure, programs, and services available at the community level. Community based programs are under-resourced, thereby compromising the community’s ability to meet their needs. Consequently, the community often faces health, social, and crime-related crises (such as medical emergencies, suicides, alcohol/drug/solvent misuse incidents, and a higher crime rate). From January to the end of March, Pikangikum is accessible by vehicle on the winter ice road. The three Rotarian travelers enhanced the lives of the Pikangikum youth by exposing them to some much needed diversion. Peter Wheatley, an accomplished basketball player and coach, provided a basketball clinic for the senior boy’s team and introduced the girls to basketball. It is uncertain if these Rotarians, when deciding to drive, fully realized the impact of dodging severe weather conditions to make the three day trek. The winter ice road was described as a “roller coaster” made of sheer ice and to add to their adventure, they learned the art of squeezing to one lane when traveling over swampy areas while dodging transport trucks. The winter road is only open for six weeks annually and is the main source of supplies for the community. Upon arrival at Pikangikum, the weary travelers discovered the newly built school gym was condemned and closed due to structural issues so they quickly improvised and changed the venue so basketball clinics could be accommodated. Another issue was the flu epidemic that forced a three day school closure so the illness could be neutralized. The Pikangikum students and parents were elated to receive the supplies from southern Ontario. The skates will be utilized to offer skating programs on the outdoor rink. The boots were desperately needed as many children were attending school in sneakers with temperatures plummeting to - 40 degrees Celsius. One child attended the snow shoe activity wearing sneakers and another had little indoor dress boots, so they were amongst the first to be fitted with warm boots. There were squeals of delight and a mad rush to choose books regarding canoeing classes. To these children, it was like Christmas! The basketball program focused on the new girl’s basketball team, a clinic for primary school children, and skill development for the boys’ senior basketball program. A fun co-operative game was also organized involving all levels of players on mixed teams. 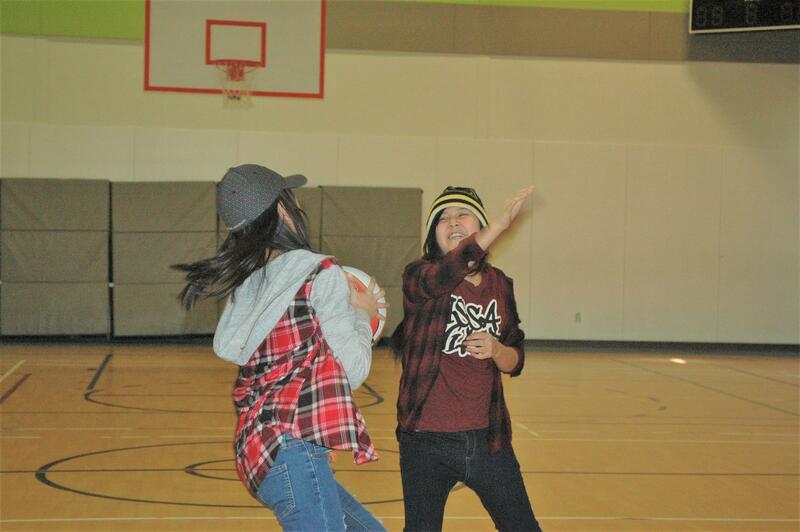 Each student participating received a Raptors basketball. Participants also received Rotary water bottles. These adventuresome Rotarians were exposed to real life experiences while residing in a northern community. Much credit and admiration goes to Jim and Marjorie Dawson, and Pete Wheatley as they solicited support and donated items prior to this trip and then had the great task of sorting and packing the trailer prior to departure. Kudos to the three extraordinary Rotarians who made a difference and formed special friendships!